Last weekend I went for a 15 kilometre walk— as in, 15 kilometres all at once. 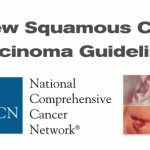 Two short years ago I could not have done that, being in recovery from surgeries and treatment for advanced melanoma, I was not physically or psychologically capable of such a feat. This year however, I was grateful to walk 15 kilometres (in 3.25 hours!) alongside a team dedicated to raising funds for melanoma research at Princess Margaret Cancer Centre in Toronto. 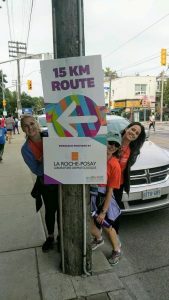 I was motivated to join this team this past spring, when our new sponsor La Roche-Posay Canada told me they were doing the OneWalk Toronto 2018, and suggested perhaps I could join them as a representative of melanoma survivors and Save Your Skin Foundation (SYSF). 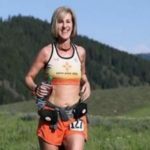 I was thrilled but also anxious about this idea – could I really do it? 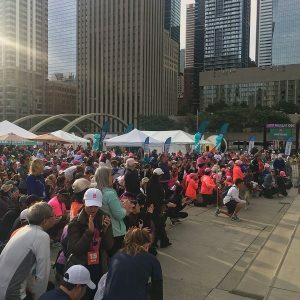 We each had a fund-raising goal and friendly instructions to meet at Nathan Phillips Square in downtown Toronto on Saturday September 8, 2018 at 7:30am. Being as I was a guest on the team I didn’t have to do any of the heavy lifting, but I was there early enough to witness the hard-working team at La Roche-Posay (LRP) setting up, distributing sunscreen samples, and greeting walkers with encouraging smiles and high-fives. I was thrilled to meet some of the folks I had been speaking or emailing with for months – it was so great to put faces with names. I had done events with LRP in the past, but this was a large local project in which SYSF and I both feel quite invested. My initiation into the team that morning was the presentation of my name tag and lanyard for the walk. I did not expect the rush of emotion when my new friend put my lanyard on me – it was a special coloured one, reserved for the cancer survivors of the crowd. 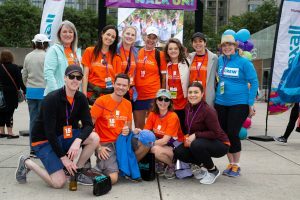 Not having participated in the OneWalk before, I was unexpectedly dazzled by the supportive community and encouragement to cancer patients and survivors at the event. Everyone everywhere was respectful of and very loving to those of us with the rainbow lanyards. At one point during the opening ceremonies, the MC asked everyone with a rainbow lanyard to remain standing, and everyone else to kneel on one knee. Our team happened to be at the front near the stage, so when this happened I was glad I had my back to most of the hundreds of people in the square all around me – my tears were flowing at this point – I was so overwhelmed I almost got down on one knee too. I was incredibly humbled by the honour I felt by this moment of silence in cancer survivors’ memory and support. 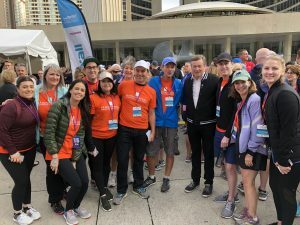 Team LRP raised over $20 000 for Princess Margaret Cancer Centre, a decent portion of the total raised $4.7 million by 3200 walkers from all over Canada. 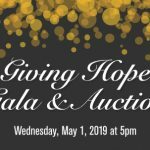 I could clearly see why the event is so successful; it is very well organized, and cancer patient care is the obvious topic at hand. Princess Margaret Cancer Centre staff and supporters made speeches in the opening ceremonies, and a couple of the Research Team Leads also got up on stage to address the crowd. Overall, it was a fabulous representation of this centre, which happens to be one of the top five in the world for cancer care research and innovation. 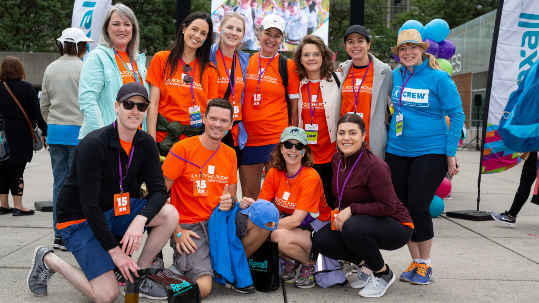 Even one of our Medical Oncologist friends and SYSF Medical Advisory Board members from PMH was present – he had done the Friday evening NightWalk – but he came after lunch Saturday to meet with the La Roche-Posay team. I am thrilled to report I got a hug from him; I couldn’t stop more tears when he thanked me for participating in the event. It’s not very often I get to thank him in person for all that the HE does for melanoma patients like me. 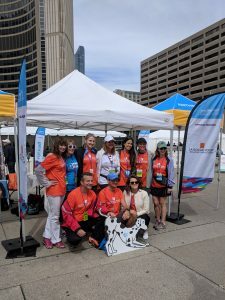 I’d like to extend huge thanks to my new friends from Team La Roche-Posay Canada, not only for their warm welcome and hard work at OneWalk Toronto 2018, but also for their dedication to skin cancer prevention and awareness all year-round. I look forward to helping facilitate the initiatives Save Your Skin Foundation and La Roche-Posay will be working on together – stay tuned for updates! Team LRP at the Finish!